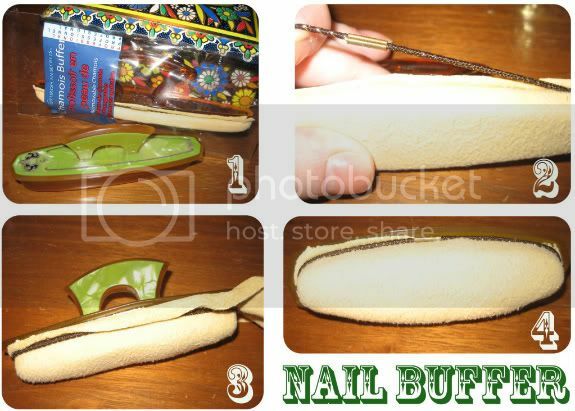 So the other day when I was making a quick run to Sally's for some bobby pins, I came across this nail buffer that was identical to many of the vintage ones that would come in vanity sets. Sally's Beauty Supply is just one of those places you can't just go in for one thing and only leave with that one thing! Anywho, I picked up this repro buffer just for the the suede-like material that looked almost exactly like the one I removed from my vintage buffer. I thought I would just share with you how I changed mine, even though it's pretty easy and self explanatory. 1. This is just a picture to show how much larger the new one was verses the vintage one I already owned. I can't even begin to tell you how excited I was to find this! I have been looking for a replacement for a while because I removed the old one on the vintage piece for sanitary reasons. 2. This repro just had a hair tie keeping the material on the buffer. It was also very lightly glued in, but came off easily. 3. I placed the material on the vintage buffer, by putting one tapered end where it would naturally go. I then placed the hair tie on to secure it while I trimmed around the edge. 4. This is the finished product. Apparently, according to the repro's package there are replacement pieces of material, although I didn't see any while I was at Sally's. I think I am going to ask the next time I am in because it cost me $7 for the whole thing and I don't want to keep buying the buffer if I don't need to. As stated before, the Chinese buy very little online due to the lack of credit cards. Will gold go up or down? Napoleon's wife Josephine, amassed an incredible collection of roses from the flowers that were brought to her by her husband's army. Steve Pavlina deleted a thread that generated some good discussion at his Personal Development for Smart People Forums.